There were a few interesting auctions on eBay recently, highlighted by one seller getting rid of a small collection that contained a number of uncommon and rare cards. A few of these lots went for quite a bit, but I was able to snag one of the lots that had the card I am featuring today. It is one of the ones in the lot that I was particularly interested in. The Rudolph Wurlitzer Company was founded in 1853, and while famous for its theatre organs and juke boxes, it produced instruments of all kinds. 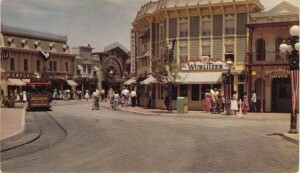 Companies like Wurlitzer, a widely recognized name from the era, did indeed bring legitimacy to Main St., Disneyland. Of course, Wurlitzer is no longer making juke boxes or theatre organs (they went out of business in 1988), and Main St. only has a few sponsors left to speak of (Kodak, and…uhh…not sure who else). 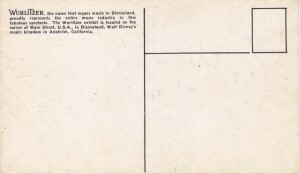 But this card is a great reminder of those early days at the Happiest Place on Earth!